Do you love to watch different movies, but didn’t have the budget to purchase a home cinema? No problem, the official franchise of the Telebrands PAKISTAN has brought a new and unique entertainment product that all the users will definitely find useful. 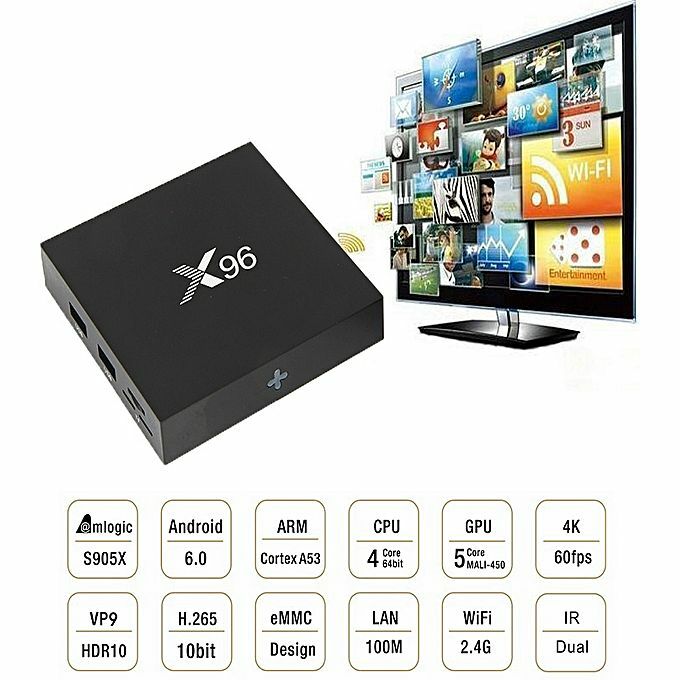 The name of this world class product is Android TV Box X96 Mini. The Android TV Box X96 Mini is basically an Android Box designed to show the crystal clear channels on your analog TV with the minimal possible effort. The Android TV Box X96 Mini is powered by the revolutionary AMLOGIC S905W Quad Core ARM Cortex-A53 Processor and it is housed by fair enough 2 GB DDRIII RAM and 16 GB of Storage. As far as the operating system of the device is concerned; the Android TV Box X96 Mini is powered by Android Nougat 7.1.2 OS that allows easy installation of Android APPS direct from the Google Play Store. The Android TV Box X96 Mini supports different types of Video Playback Format as the H.264, M4V, FLV, PMP, MKV, RMVB, MPEG-4, AVI, H.265, WMV, DIV and so on. As far as the Audio Format of the Device is concerned; the device supports the different type of audio format as the AMR, MP3, WMA, FLAC, WAV, APE, RA, OGG, AAC and so on. The Android TV Box X96 Mini also features the WiFi that allows the user to easily configure the device to the local WiFi router. The Android TV Box X96 Mini comes with the dedicated IR remote control that allows the customer to easily control the each function of the device just by pressing of a button. Aaj Tak, ABP News, Assam Talks, CNN News 18, DD News, Delhi Aaj Tak, ET Now, India 24/7, India News, India Today, India TV, Mirror Now, NDTV 24/7, NDTV India, Republic TV, News Nation, Sahara, & TV, Bindass, Colors, MTV India, Sony Pal, Sony Sab, Star Plus, Star Utsav, E24, Sony Max, Sony Pix, Movies Ok, Zee Cinema, Zee Action, Zee Classic, Zee Studio, Zee Anmol, Wow Cinema, Star Movies, Star Gold, Star Gold Select, Rishtey Cineplex, Enterr 10. The Android TV Box X96 Mini supports different ports as the USB Port, HDMI Port, TF Slot and so on. For more convenience, the Android TV Box X96 Mini also features the memory card slot that allows the customer to easily insert the memory card in the device up to 64 GB maximum. If you want to place an order of this top quality product, then all you have to do is to just dial the number 0333.4115583 from your landline or mobile number.